Vegetarian orange-glazed tempeh over rice. Lightlife Foods. Like the orange chicken you get at Chinese restaurants? Want to try a vegetarian version at home? One of the secrets which many vegetarians and vegans know is that replicating most meals has very little to do with the meat itself. After all, the most important thing about Chinese restaurant-style orange chicken really isn't the chicken - it's the sweet and tangy orange glaze that makes the dish. So, this recipe combines all the ingredients of the orange glaze​ and puts it on a great vegetarian meat substitute - tempeh - instead of chicken. The recipe calls for fresh orange juice (it really needs to be fresh for this recipe - don't use concentrate or frozen! ), maple syrup for sweetness, soy sauce for saltiness, and a few other spices as well. 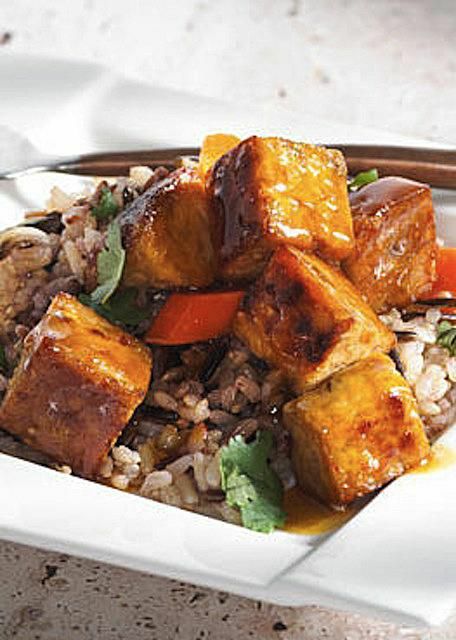 You can serve this orange tempeh over rice or just about any other whole grain, or, if you'd like more a rounder meal, you can double the glaze ingredients and add in some steamed veggies as well - try snow peas, baby corn and bell peppers to keep it Asian-themed, or even broccoli or bok choy, or just about anything, really. Cauliflower might be nice too. In a bowl, whisk together orange juice, maple syrup, soy sauce, coriander, and ginger. Simmer carrots in lightly salted water about 10 minutes or until tender; drain. In another pot; boil tempeh in unsalted water 10 minutes; drain and pat dry. In a large skillet, heat oil over medium heat. Add tempeh and brown on all sides. Add carrots and orange juice mixture and simmer until liquid is a syrupy glaze. To serve, spoon tempeh and glaze over rice; sprinkle with cilantro. Need it to be gluten-free? Tempeh is often - but not always - gluten-free, so be sure to select a tempeh which is entirely gluten-free, if needed, and swap out the regular soy sauce for a gluten-free tamari, or, you could even use coconut aminos or Bragg's liquid aminos. The remaining ingredients are all gluten-free. Need it to be a full vegetarian meal? Serve your Chinese-inspired tempeh "chicken" with Chinese scallion pancakes or the perfect white rice. Recipe and photo courtesy of Lightlife Foods.